I haven't seen, lately, how many fonts you can have on a machine, but I know it's a lot more than earlier versions. Here is a free download that will create an HTML file that will show all the fonts installed on your computer. 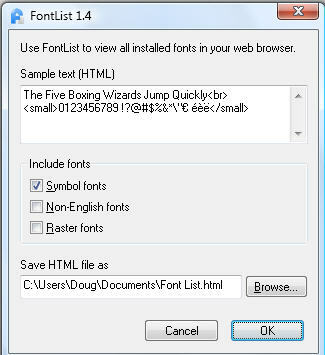 "Using FontList, you can change the predefined sample text, exclude seldom used fonts from the list and change the path for the HTML file. In your browser, you can change the style of a font and zoom in on a font. You can also view the character map of a font. And, for some, maybe the most important feature, you can create a print out of all your fonts.